I’m your stereotypical gay. I was never any good at sports at school. I never got picked for teams and had zero interest in playing ball. I’ve never been a gym bunny. So you wont find me at Fitness First or Virgin Active, getting pumped to fit into that too-tight tee. But I like to keep myself fit and in shape, and need a way to release the stresses that come with the everyday of just being a a black gay man managing this thing called life. However, I’ve always been a keen swimmer. And in moments of stress or if that holiday has been booked and involves a beach, you can guarantee you’ll find me in my local pool tearing down those lanes, disproving all those who say black folk can’t swim because of ‘our big bones’! But swimming is seasonal. The winters are too cold and in summer, finding a pool free from screaming kids is near impossible. Tired of my moaning, a friend recommended that I try yoga as alternative. After one or two classes I was bitten by the bug. I bought myself a yoga mat, downloaded an app, tried out several studios, took a few classes and then finally took out membership with my local studio. I attended classes religiously. Yoga changed so much for me. I slept better, my stresses melted away, I was more flexible and supple (which is always handy ;-). My ongoing practice had an cumulative affect. Before I knew it, my diet had changed, I’d cut down on drinking and I actually felt like a better, kinder man. Practising every morning for 20 minutes, set me up and got me mentally prepared for the day. A class after work or on a Sunday morning helped me to lose all the stresses the world throws at me. However, in those classes I was always the only black man. Every week I would rock up, in the hope that once just once there would be another brother in the room, who I could connect with. No one ever made me feel unwelcome. Yogis are generally nice people. The type that declare that they ‘don’t have a racist bone on their body’, but I wanted the time I spent connecting with my self spiritually and physically to be shared with people who looked like me and on some level felt like me. Yoga spaces are overwhelmingly white and if you look at any advertising for it you’d think it was for healthy looking, tanned young white women. The cost of a class, usually between £10-18, makes regular practice unaffordable for most people. I searched high and low for affordable, classes run by a black yogi in the hope that it would attract more people of colour. I found a number of great teachers and classes filled with men and women of colour. But not a single one in the UK. 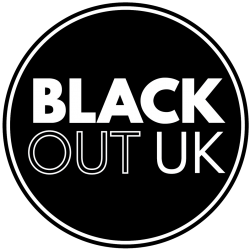 With this is mind and following the BlackOutUK principle of creating spaces ‘For Us and By Us’, I decided to set up my own classes. I approached two fellow black gay men, Gerrard Martin and Junior Valentine, both experienced yoga teachers and Black Yogis was born. Our aim is to create a safe space for Gay, Bi, Queer and SGL men of colour to come together to connect with each other through the practice of yoga. Through practice we hope that men who come along to the class will not only develop their yoga, but also have improved physical and mental well-being. By connecting with other queer men of colour we hope that we are developing and building a healthy community. Led by Junior and Gerrard, the classes will be held on a Tuesday evening and Sunday afternoon in central London and cost only £6. The classes are designed to be open for everyone, from beginners to experienced yogis of all ages, and you can go at your own pace. So if this is your first or fiftieth time practicing, we’ll ensure that everyone get the best out of the class. Read: Got your copy of Vogue yet?